If you love the idea of a relaxing soak in your own backyard hot tub, but don’t want a big, unsightly plastic and fiberglass tub, why not try one with a more organic look? 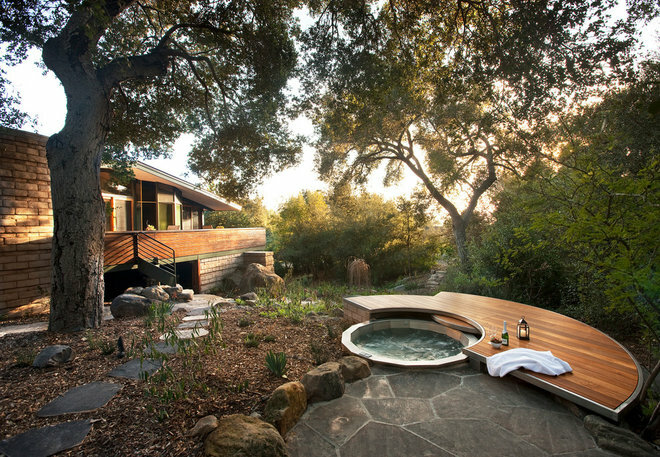 With wood, stone or concrete surrounds (and some strategic landscaping), these 12 hot tubs complement their natural surroundings — so you can enjoy the view and soak in peace. Curvy surround with sliding cover. 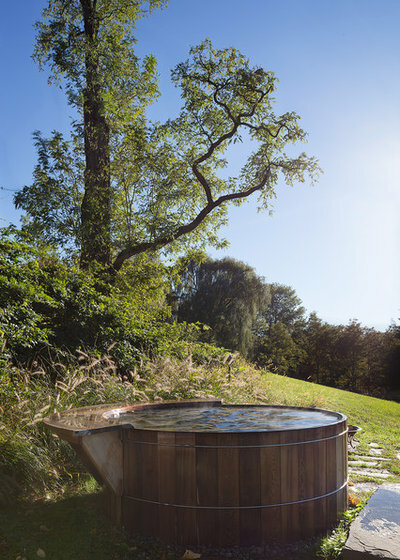 This innovative tub, which the designers call the 007 Spa Deck, includes cedar decking set into a stainless steel frame, with a cover that slides into place. The swoop of the deck echoes the roundness of the hot tub, helping the tub look at home in the landscape. Nestled into rocks. Tumbled rocks hug this beautiful wooden tub, creating a natural staircase into it. 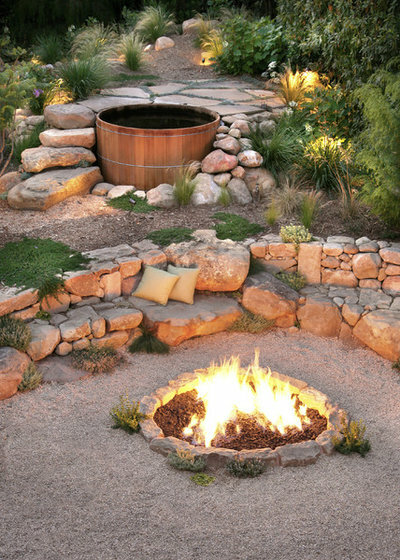 Rocks are also used here to create a built-in bench surrounding the fire pit. Wood and stone. 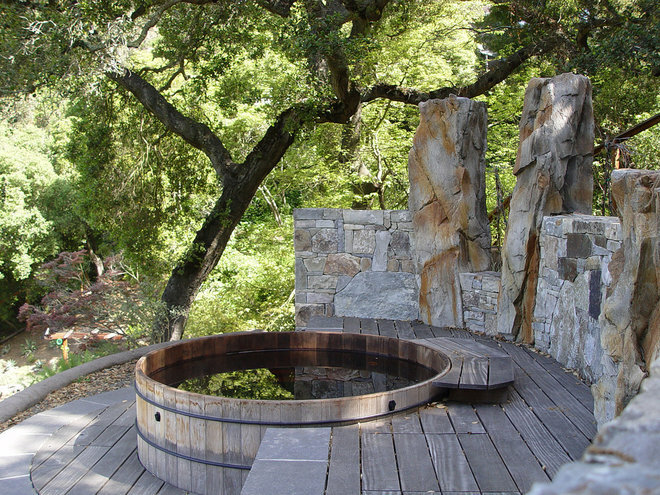 A stone wall makes a striking backdrop to this redwood hot tub tucked among the trees. The tall stone pillars also help block wind and provide privacy. Floral screen. 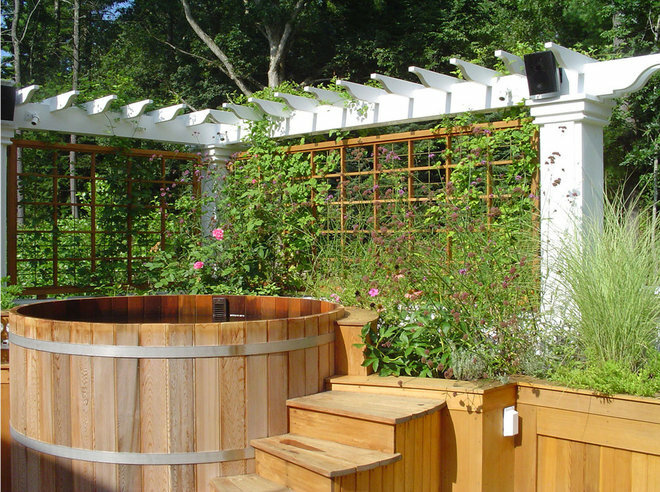 Trellises on two sides of this wooden hot tub provide a support for climbing flowers to grow on, creating privacy and a sense of romance. Perch with a view. 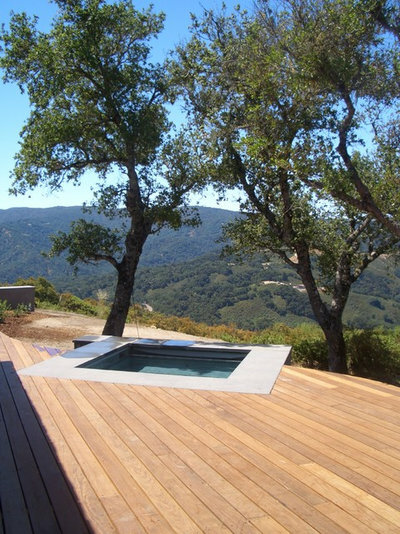 Another concrete design, this tub is set at an angle to take full advantage of the dramatic view of Carmel Valley, California. The concrete surround set into a wooden deck has a sleek and simple look that works well with modern homes. Below deck. For privacy from above, you can’t beat a hot tub protected by an overhang. 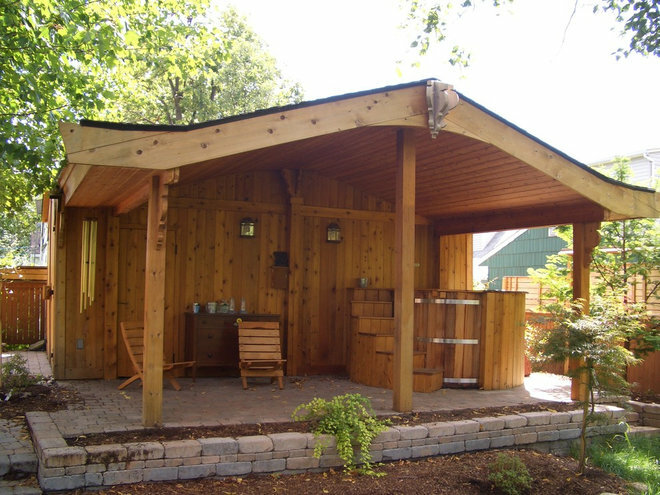 In this Ottawa, Ontario, backyard, a wooden hot tub is tucked beneath the roof of a redesigned shed, bringing a healthy dose of relaxation to what could have been a purely functional space. Rooftop getaway. 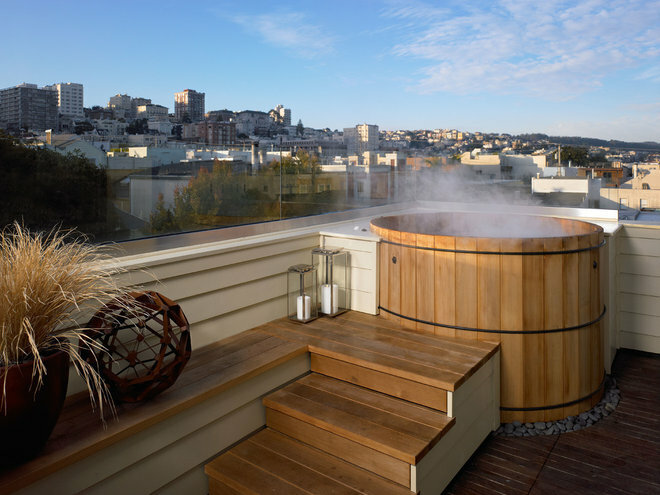 Why not enjoy that spectacular city view while soaking in a serene wooden tub? Just be sure to check that your building allows (and can handle) the weight of a hot tub before going ahead with your plans. Natural cover. Why stop with just a wooden tub? A wooden cover made to match will protect your tub beautifully between uses. Low-slung modern. A partially sunken tub like this sleek modern one is easier to make private than a fully aboveground tub. 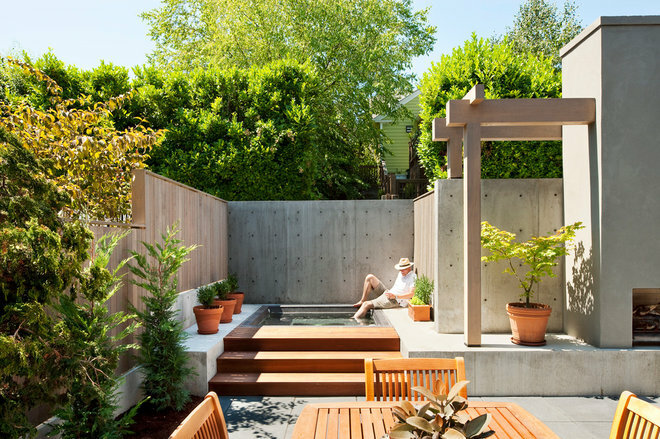 Here simple wooden decking stairs surround the tub on one side, while thick hedges and trees on the other provide a feeling of protection and privacy. Urban backyard. 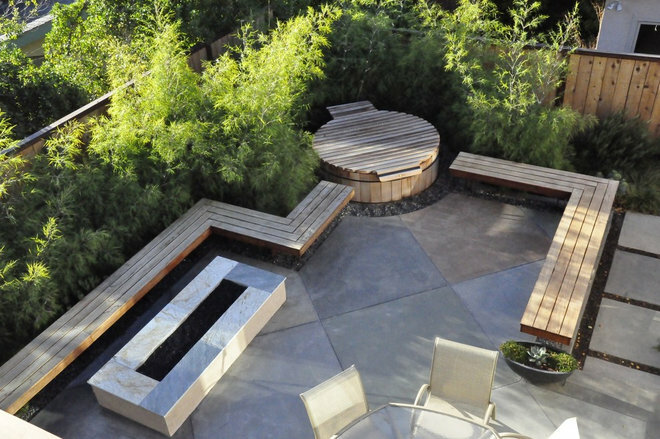 The hot tub in this Seattle yard has a concrete surround and wooden steps, creating the look of a sunken tub without actually its actually being sunk below ground level. 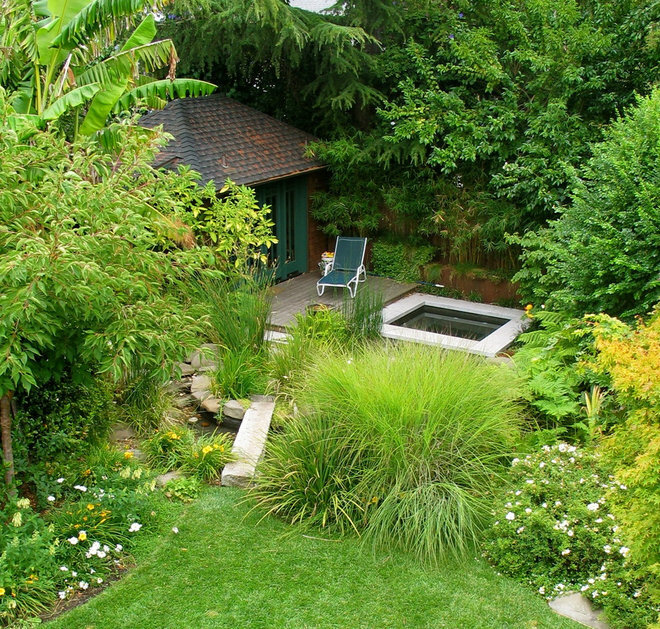 High privacy fencing (and even higher trees) create a secluded feeling, even with close neighbors.